The Shakespeare’s Birthday Celebrations in Stratford-upon-Avon are lucky to be sponsored by a number of key organisations, who are all committed to continuing this tradition. 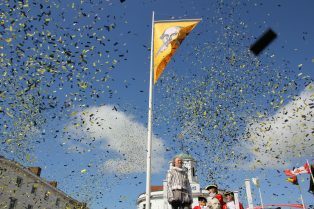 The two Councils provide the Shakespeare’s Birthday Celebrations’ principal parade, which is hosted by the Town Council and attended by diplomats, notable visitors, local dignitaries, community groups and school children. LSD Promotions are a long established Midlands based company that provides quality markets and events. The Councils have worked closely with LSD Promotions, who are providing many additional attractions, including the second ‘National Living Statue Competition’ which is exclusive to Stratford-upon-Avon, and is set to become an annual event. Shakespeare’s England is the official destination management organisation for Stratford-upon-Avon, Warwick, Kenilworth, Royal Leamington Spa and the surrounding towns and villages. And significantly contribute to raising the awareness of the celebrations to the wider community.